There was a woman I worked with at my last job I'll call Pat who had the mystifying habit of answering anything one might say with, "Yeah, I know! Right?" It didn't matter if you said, "The report is due at noon." It didn't matter if you said, "I think my cat has fleas." It was with only supreme self control that I did not test my hypothesis that anything could prompt Pat's signature reply with such baits as, "I think I might go to lunch on Saturn today, the burgers on Jupiter are a sad state of affairs." As I continued my Spring Cleaning Extravaganza yesterday, scrubbing away at the pendant lamp over the dining table, the texture of which can only be described as "furry," I couldn't get Pat out of my mind. Here I thought I had made pretty darn good progress in the Quest for a clean, tidy, and organized home. We've had dozens of visitors in last year: friends, family, out-of-town guests, workmen, contractors, delivery people, a plumber, an electrician, a man who measured and installed some blinds. I imagined Pat accompanying someone on their visit. After leaving, maybe in the elevator, the visitor might shrug his or her shoulders and say, "Well, yeah, she's made some improvement. But did you see the pendent lamp?" And Pat would say, "Yeah, I know! Right?" Which would break the spell, because this time, her response would actually make sense. And she'd be free of her strange compulsion at long last. This week was supposed to be Spring Cleaning Planning Week, a little trick that worked like a charm. There's nothing like saying, "the idea isn't to do something" to feel like doing it. So I resist my resistance to action by forbidding the action, and then use the momentum of the action started to keep going. Pretty clever, huh? I found a good place to get started was the supply cabinet under the sink, which would give me the chance to take stock of the supplies I have on hand while making tracks on this year's big Spring Cleaning Kitchen Chore, cleaning and organizing the kitchen cabinets. It was also a good place to start in that it was relatively easy; last fall, we had a leaky faucet that necessitated clearing everything out of the cabinet, thus learning the hard way what unhappy business it is to wait until an emergency to get things organized. Having gotten rid of 10 year old flea spray and other such relics in the fall, clearing out the stuff was pretty painless this time around. I'd already washed all the rags and cleaning cloths the week before, so that didn't need to be done, either. All told, it took me 48 minutes to clear everything out, wash and dry the liner I'd put in after the leak fiasco, wash the trash can inside out, wipe everything down and put everything back. Okay, it's official: the first day of spring. We can finally get moving on that Spring Cleaning business without seeming hasty. The best thing about spring--rejuvenation--also applies to spring cleaning. According to the merriam-webster dictionary, "rejuvenate" alternately means "to make young or youthful again: to give new vigor" or "to restore to an original or new state". Washing away accumulated dirt and grime, restoring order, mending a cherished quilt, rediscovering the lovely texture of wood grain in freshly polished furniture, or reclaiming a chandelier or a window to sparkling splendour are all what I call "double-duty rejuvenators", in that they rejuvenate one's spirit as much as the physical space we inhabit. I have a confession: after nearly three years on The Quest, I've never actually committed to an honest-to-gosh Spring Cleaning Extravaganza. I'm making my committment now, and I invite you to join me. There's thirteen weeks until the summer solstice, which gives us one week to plan and twelve weeks for spring repair-replenish-and-rejuvenating action. I'll post my projects and progress, complete with﻿﻿﻿--yes!--Horrifying Before and Inspiring After pictures! And the O-Quest Pig Scale! If you'd like to share your own goals and progress, I encourage you to do so in the comments section. You might inspire yourself and others as we move through the season of exciting change, growth, and rejuvenation. Photo of wild flowers by Alpay Ulku. Used with permission. When you think of the term "Spring Cleaning," visions of floor-scrubbing, kitchen cabinet cleaning, and linens-on-the-clothesline come to mind. And sure, that is or can be part of it--one part. But the annual ritual involves more than deep cleaning. Along with an ﻿out-with-the-old/in-with-the-new momentum, there's also a desire to take stock, and in doing so stock up on what you need to make good on your plans. Replenishing as a part of Spring Cleaning can mean anything from buying in bulk to save money, to making plan-ahead purchases so you have the supplies you need when you find you have a few minutes to shine up the silver or polish a piece of furniture or two. Using the products that work for you--and getting rid of those that work against you--is one of the small pleasures and rewards for undertaking the great Spring Cleaning ritual. "Spring Cleaning" is another of those terms that really should be revised. "Spring Projects" seems more applicable, as the point is to tackle all those niggling little things you've avoided during the cold winter months when motivation runs as low as the temperature outside. Repairs are a great way to kick off a Spring Projects Spree, in that they can make a big difference in relatively short order. Oiling creaky hinges, insulating a drafty window, or smoothing stain over scratched wood can provide an almost instant pick-me-up, and alleviate an energy-sapping annoyance. My yearly ritual is to go through the house and make a list of all the stuff that needs repairs--paint that needs to be touched up, areas that need to be re-grouted, nail holes that need to be filled. It makes it easy to identify the supplies I'll need, and, if costly, to schedule their purchase. Mid-July is here, which in my book is mid-summer, nevermind the naysayers who insist on pinning mid-summer to the summer solstice. I mean, how can June 20 or 21 be mid-summer, when in my day we didn't even get out of school for summer vacation until June 15 or so? You don't have to be a rocket scientist to know that summer = summer vacation. Even if you aren't in school or have kids. In my experience, by mid-July, I run out of a little steam. In the beginning of summer, there's an irresistible urge to make plans, draw up lists, create goals, and decide on projects. It's like New Year's Day, without the hangover or the prospect of months of dreary weather to contend with. While it may seem like summer is slipping by, it's not too late to dust off those lists and re-commit to a goal or project while the days are still long. Why not make it something fun? Regina Leeds, in her book, One Year to an Organized Life,dedicates July to such fun projects as pulling your address book together, organizing photos, and scrapbooking--all ideal, shady-porch projects. Tackling a junk drawer or going through a jewelry box are both good lazy-day projects. For the more ambitious, there are all those big, outdoor projects: house-painting, gutter-clearing, and yard work, not to mention scrubbing oil stains from the driveway, cleaning windows, and power-washing the deck--projects that just aren't meant to be when it's -10 degrees outside. Summer is also an ideal time for organizing the garage, shed, or basement, clearing out a storage unit, or having a yard sale. This weekend, I think I'll review my project list and pick a few things I'd like to focus on. I know I'd like to finish up a few things and also to start something new--I just need to decide what. What about you? I'd love to hear about your summertime projects and plans! Okay, I know some of you are thinking: an entire week? on a drawer? Truth be told, I don't have a makeup drawer--cosmetic vault is more like it, including but not limited to an old-fashioned, five-drawer vanity big enough to store several thousand lipsticks. What else? Three medicine cabinets. Two hatboxes. A few drawers here and there in my study. The counter in the master bath. The top of a chest of drawers and the top of the aforementioned vanity. A couple large ceramic pots. Some storage boxes. And still I run out of room and have to steal space in Alpay's closet. "You can have half the shelf back if you start buying eye shadow," I'll say, but Alpay remains unmoved by the promise. Obviously, things are out of control. So that's what's up this week: I've decided to give my cosmetics a super-thorough shake down and encourage you to join me. In the process, we'll review storage guidelines, expiration recommendations, and safety tips, as well as strategies to nudge you along in keep-or-toss decisions, products to help organize and corral supplies, and techniques to restore and maintain order. When it comes to organizing, the best system is the one you come up with to suit your particular life circumstances. Systems devised by others can give you ideas, but it rarely works when you try to follow them to the letter. Not that I haven't tried. There's something irresistible about other people's systems, the promise being that if only you could stick to a system, you'd never be caught with an empty fridge or messy living room ever again. a "27 fling boogie" in which you throw 27 things away; I'm not sure if this is a daily event or not. In addition, there are optional "early afternoon" routines, "after school" routines, and "late afternoon" routines. There's also a subscription service to keep you on track, resulting in about 16 or 17 emails a day reminding you to go to bed or get off the computer, as well as to check on your laundry or start dinner. So by my account, the least amount of time you'd need in order to follow flylady's system would be 3 and a half hours a day non-stop; more like five if you count doing laundry throughout the day, as well as doing regular chores not mentioned in the routines and lists, like ironing, or making dinner and setting the table (which is what the "late afternoon" routine is for). In fact, it's a very good schedule if you happen to be home all day and don't have a regular job, kids, or outside interests of any kind. No wonder I could never follow the system! While I typed up my own room-by-room chore list last week, what I've found to be the most helpful in keeping me squared away remains the "ground zero" approach: whatever calls my attention the most is what I work on, when I have the chance to do so. Sometimes this means tackling the bathroom; other times it's picking up my study or preparing enough food to last a couple days during the week. I may run out of clean socks on occasion, but it's a small price to pay for having a life. All right Questers, I've been busy. I took the chore lists from the last four posts and cross-referenced them by room and by frequency of chore. Then I researched a way to link the two documents, so if you edit one list, you automatically update the other. This document contains links that may refer to other files. Do you want to update this document with the data from the linked files? Why are bedrooms so tough to maintain? You'd think that since the bed alone takes up so much space, the bedroomshould theoretically be the easiest room in the house to clean--just make the bed and you're halfway there. But I've noticed that bedrooms often get the short shrift when it comes to cleaning and organizing, perhaps because the relatively private nature of the room pushes it down on the list of chores. I know our bedroom tends to be a clutter magnet: heaps of clean laundry, piles of books, and all kinds of what-not seem to find its way onto the bedside chair or the vanity or the chest of drawers. When that happens, I know it's time to get tough and re-claim the space for its intended purpose, as a place for rest, relaxation, and enjoyment. Weekly or Every-Other-Week: "Clean the Bedroom Basics"
Weekly or Every-Other-Week: "Clean the Bathroom Basics"
Remove everything that's out--soap dish, shampoo bottles, etc. When To Take Down The Tree? Okay, I confess: I am not one of those people who takes down the tree promptly after Christmas. I do have a bit of an excuse: since Alpay and I usually exchange gifts on New Year's day, the tree obviously has to do its holiday duty until then. Taking it down on January 2 is out of the question; it just seems a little rash. Actually, the whole first week of January seems a little premature for tree dismantling. If there's one month you could use some holiday cheer, it's January. The second week of January could conceivably be the perfect time to take it down, but by then I have usually accustomed myself to its presence, and since we buy a freshly-cut tree every year, why not get our money's worth out of it? Finally, some time around the Super Bowl, I'm ready to imagine life without pine needles crunching underfoot. The tree, stripped of all dignity at this point, retaliates by morphing from plant to weapon. The needles that are left are both razor-edged and determined. I wear long sleeves and heavy-duty leather gloves when taking the ornaments off, and have bandages and Bactine ready. This year, of course, is going to be different. I hereby pledge to take the tree down before the third week of January. Probably the second week. Maybe even next weekend! Well, I'll consider it, anyway. Don't want to make any rash promises. Are you a Stash-n-Dasher? You know: company is coming over and you don't have time to put everything away, so you gather everything up, and put it some place--a room, a closet, the basement--and then you close the door. Stash-n-dashing is the organizational equivalent of buy-now-and-pay later, and believe me, you will pay later, as nothing has the potential to create chaos faster than repeated stash-n-dashes. Good luck trying to find anything after a stash-n-dash; it disrupts your sense for where things are located, and completely puts you back in terms clearing and organizing a space. I used to be Queen 'O the Stash-n-Dash. In the early 90's when we lived in Iowa, we entertained almost weekly, which means I stash-n-dashed at about the same rate. The consequences of this can still be felt to this very day. How? Well, you know those 81 boxes I still have left to go through? At least 20 are the result of those Iowa stash-n-dashes. Above: My last stash-n-dash, circa 2003: Doesn't it look tidy? Don't you just love the slippers tucked under the bed just so? Who would have known that it had looked as it did, below, before the stash-n-dash? Some time about five years ago or so, I swore off stash-n-dashes for good. This means that I have had stacks of boxes, or papers, or books or whatnot, in my study, or in the bedroom or in a corner of the livingroom when we've had people over, and with the possible exception of my sister in-law (not the one who is my brother's wife), I don't think anyone has minded a bit. The only time I've stashed-n-dashed in the last year was the two or three times we had over-night guests and needed to sufficiently clear my study in order to accommodate the queen-size blow-up guest bed. Even then, the S-n-D's were pretty minimal. This month has the potential for guests and entertaining; as such, the risk for stashing-n-dashing is high. Instead of giving in to the S-n-D urge, how about trying the Pass-By Approach, in which you put one thing away at a time, each time you pass by a particular area? It's an easy, low-stress way to clear an area, and is a lot less stressful than dealing with the after-effects of a stash-n-dash. Wouldn't it be nice if, by the end of this month, you were actually more organized? Exhausted by the grueling cookie-selection process, I decided to pass on organizing the kitchen cupboards today, but didn't entirely slack off: what has actually been bothering me lately is the mound of paperwork that has gathered under my desk since last winter. Somehow the under-the-desk-mess escaped the shred-or-file fate of the Supreme Paper Mess I confronted this summer. I also wanted to tidy up my room some, knowing that it was now-or-never, or at least now-or-after-the-new-year. And so I settled down and used my first-pass strategy of focusing on the toss-or-keep decision. 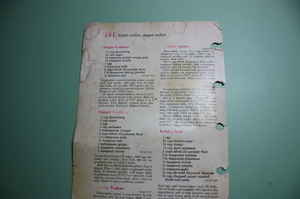 Imagine my surprise when, among the old catalogs and flyers, coupons and receipts, pictures and letters and bills and manuals, I came across the sugar cookie recipe, which I hadn't even realized I was missing in the first place. It's one of the few cookie recipes on my list that actually come from a book, in this case an ancient, binder-bound copy from Better Homes and Gardens in which the woman all have elaborate manicures and wear aprons. 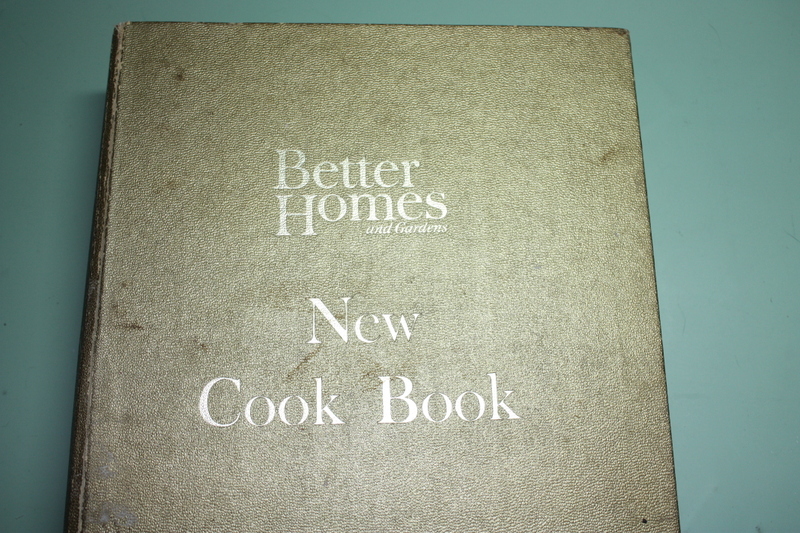 While I have perhaps two dozen copies of my mother's banana bread and Mexican Wedding Cakes recipes--because God forbid I lose them, they'd be forever gone--I'd never bothered to make copies of the retro Better Homes and Gardens sugar cookie recipe, because I figured it was in a book and thus safe. 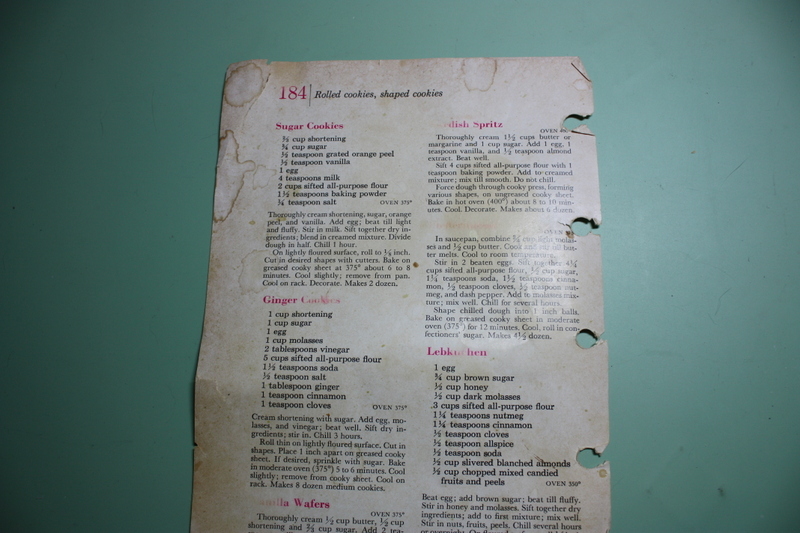 But that recipe is actually unique itself, calling for grated orange peel among other surprising ingredients. I've never found one anything like it, which explains in part why store-bought sugar cookies are so inedible. The close call scared me straight. I solemnly swear to organize my recipes--and make copies of my favorites--once and for all. When I was growing up, there always seemed to be a supply of mystifying, old-fashioned objects that were cast-offs from the much older children of my mother's friends: a hot curler set with matching, color-coded clips; items to set up a miniture grocery, complete with cash register and tiny milk jugs and orange juice cans and little packages of eggs, all mysteriously printed in German; a wonderful globe with black-colored oceans and names of countries that no longer existed; Nancy Drew books in the first few printings with teenage Nancy in 40's-style clothes, looking like somebody's mother. One of the books I loved the best was called Teen Beauty. It featured a ballerina or a ballerina look-alike on the cover and contained many lists, my favorite of which was a list of what-to-do-when routines. There was a routine for the morning and one for the night; lists of what to do daily, weekly, monthly, seasonally, and yearly. Each list was bulleted and contained categories with subcategories and subcategories of subcategories, in which hair was specified not only to be washed but rinsed, twice in fact, for a total of three bullets, not counting the separate bullets later on for hair--towel dry; hair--comb; hair--set; hair; dry and yet more combing. I have no doubt that thousands of middle-age OCD suffers point to Teen Beauty as a source of their list-making compulsions. I myself can appreciate a good list, but it has to be of my own making; I never find other people's lists particularly helpful even if I do find them interesting. So while I was attracted to the Real Simple periodic table of chores for categories that are color-coded by chore frequency, I couldn't quite squelch the "you're kidding, right?" reaction I get whenever someone imagines I should do something like "disinfect doorknobs" every month. On the other hand, if I waited the recommended "6 to 12 months" to scrub grout, I think I could win a look-alike gas-station bathroom contest. And yet: as Stacy told me last week, there is something reassuring about such lists. I think that's especially true for those of us who largely learned what to do or how to clean from magazines. A list, even somebody else's, provides a foundation that we can tweak to our own needs.